A lot of people damage their hair without even realizing it. It's breaking off, it feels brittle, and it won't grow, but they can't figure out why. Here are some things you might be doing on a daily basis that can damage your hair. Eliminate some of these bad habits and your hair will be a lot healthier! 1. Using too much heat. I'm sure you've all seen the video of the girl who burns her hair off with her curling iron. In part of the video she recommends holding the curling iron your hair for "twenty seconds or longer." I don't think I've ever, EVER held a curling iron or flat iron in anyone's hair for twenty seconds. If you need to hold it that long, you need a new curling iron. It's hard to completely cut out heat from your hairstyling routine, but just be careful not to overdo it or spend too much time on one section, and be sure to move quickly over the ends. If your ends are dry and brittle looking, get a trim instead of trying to flat iron them until they are smooth. Backcombing, ratting, poofing, whatever you want to call it, it's very popular here in Utah. People don't realize how damaging this can be to your hair. When it's time to wash or brush out your backcombing every day, it can cause a lot of breakage to your top layers. Instead, try to get more volume with round brushing, volumizing products, and a minimal amount of backcombing. 3. Cheap tools and cheap products. This is the one that everyone hates to hear because no one wants to break the bank trying to have healthy hair. If you can't afford all professional hair tools and products, the most crucial things NOT to go cheap on are your blow dryer, flat iron and shampoo. Cheap shampoo has a lot of harsh chemicals that will dry out your hair instead of moisturizing it. Seriously though. Cheap blow dryers and flat irons will do a lot more damage to your hair than nicer ones. Nice blow dryers and flat irons minimize damage and smooth your hair, while cheap ones don't. 4. Being too rough with it. Whether it's ripping through it with a brush after a long day, frequently wearing it in a tight elastic, backcombing it to shreds, or not brushing it at all for several days, all of these things contribute to hair damage and breakage. Be gentle with your hair, it will thank you. 5. Washing it too frequently. There is much debate about how often you should wash your hair. How much is too much? The truth is, it varies greatly from person to person. If you have to wash it every day so you don't look like a grease ball, avoid shampooing your ends and only shampoo your roots. This will prevent your ends from drying out, but still take care of the grease. If you are currently washing it every day but notice that it seems dry, try going a few days in between washes to help restore some natural oil in your hair. Box color is every hairstylist's greatest nightmare. Why? Not because it helps people save money on their hair, but because it is so incredibly harsh that it's nearly impossible to get out. When box color is made, they have to formulate it so that it can work on virtually any hair color or type. So if you have fine, blonde hair and just want to go just one shade lighter, that box color is also harsh enough to work on someone who has coarse, black hair. 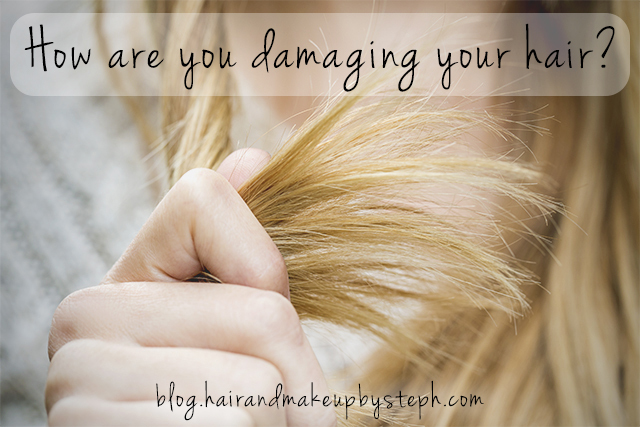 So you are essentially damaging your hair unnecessarily. Scary! 7. Going too long in between haircuts. This is an important one. The longer you go in between cuts, the more you will get split ends that eventually just start breaking off. Get a trim every 6-8 weeks to keep the split ends and damage under control. If you are growing it out, tell your stylist you only want the bare minimum taken off. Long hair isn't pretty unless it's healthy, so try take care of it along the way. 8. Changing our hair color at every single appointment. I have some clients who like to drastically change their hair at each appointment. Some have even said to me "I don't care if it's damaged, just get it to look like this picture." Gah!! Changing our hair is fun, but if you want it to be healthy, avoid doing something drastic every time. Before switching up your hair color, consult with your stylist to see if it will be damaging to your hair, and if your hair is healthy enough to handle to handle the change. If not, make the change gradually.